It’s undoubtedly a big week for Apple. With the announcement of the iPhone 8, iPhone X, Apple Watch 3, AirPower wireless charger and Apple TV 4K at its live event, it would be easy for the smaller changes to be missed. But that doesn’t mean that small changes aren’t happening. One such change is the streamlining of iTunes for desktop, removing the App Store with the update to 12.7. Don’t worry, this doesn’t mean that the App Store is going away, just that it will no longer live in iTunes. Considering most people probably do all their app management in the App Store on their devices anyway, we can’t imagine this making much of a difference in people’s lives, other than giving you one less reason to download iTunes. According to the Apple support page, the change is coming because “the new iTunes focuses on music, movies, TV shows, podcasts, and audiobooks”. 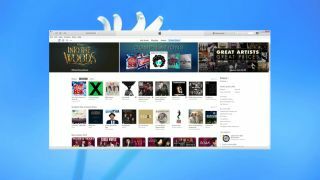 Other changes that support this move include the transition of Apple’s educational iTunes U content into the Podcasts section, and the addition of Internet Radio in the sidebar. With iOS 11, you’ll be able to download previously purchased ringtones directly to your phone too. So, small changes, but some handy streamlining. Don't worry, the best podcasts are still found on the new iTunes.